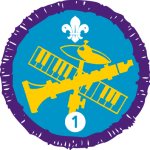 The Musician Staged Activity Badge can be achieved from Stage One through to Stage Five. To complete the Musician Stage One award, you must complete all of the activities from each of the following sections. Sing or play two different types of song or tune on your chosen instrument including performing in front of other people either within Scouting or at a public performance. Tell your Explorer Scout Leader or assessor about the music that you like to listen to. To complete the Musician Stage Two award, you must complete all of the activities from each of the following sections. Reach the required standard for Grade One of the Associated Broad of the Royal School of Music, or similar, for your chosen instrument. Tell your Explorer Scout Leader or assessor about the music that you like to listen to and how it differs from the music that you play or sing. To complete the Musician Stage Three award, you must complete all of the activities from each of the following sections. Reach the required standard for Grade Two of the Associated Broad of the Royal School of Music, or similar, for your chosen instrument. Sing or play, as part of a solo, a duet, or in a group, three different types of song or tune on your chosen instrument. This must include a performance within Scouting or a public performance. Reach the required standard for Grade Three of the Associated Broad of the Royal School of Music, or similar, for your chosen instrument. Sing or play, as part of a solo, a duet, or in a group, two different types of song or tune on your chosen instrument. This must include a performance within Scouting or a public performance. Reach the required standard for Grade Five of the Associated Broad of the Royal School of Music, or similar, for your chosen instrument.